Visitors to what used to be Buy.com will see a few changes on the front page this week—including a pronunciation guide for its new name. The site is now branded "Rakuten," after Japan's largest e-commerce firm, a massive online conglomerate that dominates even U.S. giants like Amazon at home. 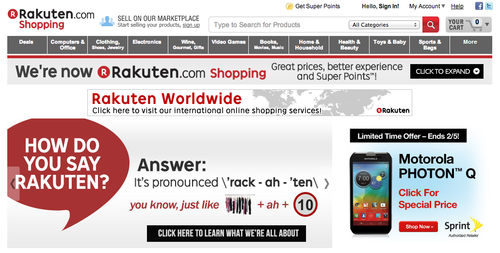 Rakuten (the site suggests it is read "rack"—"ah"—"ten") bought Buy.com in 2010 for $250 million as part of a global spending spree, and has been gradually rebuilding it since. The old Buy.com, which mainly sold directly to customers, has been swallowed whole. It is now one of thousands of stores in a giant online shopping mall, along with those run by firms like Petco and wine.com. The online mall, "Rakuten Shopping," is an attempt to recreate the brand's success in Japan, where it is a household name and about 60 percent of the population are members. Rakuten, the characters for which mean "optimism," is converting acquisitions to branded online shopping malls all over the world. It has already rebranded online retailers Ikeda in Brazil and Tradoria in Germany, and sites like Play.comin the U.K. are on the way, as it moves toward its ultimate goal of establishing a global mega-mall. Rakuten already offers cross-border purchases on some products through its "Global Market." The company feels strongly that this strategy, which focuses on luring retailers and fostering relationships between them and customers, is different from the one taken by the online retailer it is chasing in most markets. "You can't think about e-commerce without thinking Amazon," said Mark Kirschner, global chief marketing officer. "But Amazon is really focused on a vending-machine shopping experience—you search, you find, you buy, you're done." In Japan, where Rakuten is omnipresent, its businesses include online travel, auction and e-books, plus a bank and securities firm, as well as a baseball team, the Rakuten Eagles. But at the core is its giant online shopping mall, and the difference between shopping there and on Amazon's Japanese site is immediately clear. While searches on Amazon lead straight to product listings, from either its own offerings or others that sell products through its site, browsing through Rakuten often takes one to the virtual storefronts of its retailers. The company feels strongly that shoppers want to browse and connect with those they are buying from, even online. "People love to enjoy the shopping experience, they love to enjoy things," said Kirschner. "We're also trying to add this more emotional, this more human aspect. We make it easier for consumers to know who they're buying from." This has proven true so far in Japan, where Rakuten also locks in customers with aggressive point rewards and deals that span its various online businesses. Its large number of small virtual shops also means it can offer a vast inventory of specialty items—Rakuten's Japanese shops offer thousands of styles of traditional kimonos from all over the country, for example, many with phone numbers listed for help with purchases. "Rakuten's strength is its large number of merchants, so they have products that are hard to find in other places," said Hiroshi Naya, an analyst at Ichiyoshi Research Institute in Tokyo. Naya says the model should also help it quickly add online inventory in foreign countries as it strikes deals with such retailers. But he warns that Rakuten had very fortunate timing in Japan, where its growth largely coincided with the spread of the Internet to homes. "Rakuten was one of the first to launch this kind of business in Japan, and it rode the wave of Internet expansion from around 2001," he said. The company is due to announce its earnings for the fourth quarter of 2012 and full fiscal year on Feb. 14. Through September, it booked $310 million in profit, on revenues of more than $3 billion. Rakuten has used its strong earnings at home to fund its global shopping spree, which has also included Canadian e-book reader firm Kobo, a major investment in the Pinterest photo-sharing site, and French logistics firm Alpha Direct Service, or ADS. The company hopes to export the technology it acquired from ADS to its other markets, to offer retailers the use of its logistics and help it compete with Amazon's powerful infrastructure. The firm has shown a willingness to sacrifice profits in the near term to enter new markets and businesses, and make sacrifices like mandatory English even at home, to fuel growth. It is pouring investments into its Kobo e-reader business and its online book catalog in Japan, for instance, as competition ramps up with Amazon, which introduced a Japanese Kindle and e-book store late last year. "This business will make a large contribution to Rakuten over the mid-term, but it is inevitable that there will be expenses in the near future," Taro Ishihara, an analyst at Daiwa Securities, wrote in a report on the company. One concern for Rakuten is whether the younger generation of shoppers, who are used to zooming in on results using search engines and pinpoint online shopping, will take to its online mall concept. An online poll of 1,000 Japanese users by mobile portal operator Ceres found that while Rakuten is the most popular shopping site, Amazon is dominant among users under 20. "I just find Rakuten's site too crowded for my taste," said Keisuke Sorita, a 22-year-old student who often buys CDs and games online. "It's easier for me to search and find what I want on Amazon."